On a dark night in November 9, 1938, the Nazis murdered several hundred Jews, burned 1,400 synagogues across Germany and Austria, destroyed Jewish homes and businesses, and vandalized Jewish hospitals, orphanages and cemeteries. 1,000s of Jewish men, women and children were dragged into the streets, where they were beaten and humiliated. Its 80th anniversary is commemorated at a time when anti-Semitism in the world is escalating. 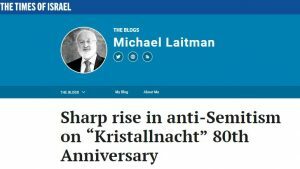 “Kristallnacht,” the Night of Broken Glass, unfolded around 6 years after Hitler assumed power and marked the beginning of the Third Reich, the systematic persecution of Jews, culminating with the Holocaust that claimed 6 million lives while the entire world stood by and basically did nothing to stop the carnage. As humans do not seem to learn from the past, anti-Semitism is nowadays not a historical reference but a very current reality in Europe and the rest of the world, expressed as anti-Jewish and anti-Israeli sentiments, attributed either to the extreme left or to the extreme right. In order to trace the source of anti-Semitism, we will go back 3,800 years to the depths of the Israeli nation. Mesopotamia was the cradle of human civilization. Until then, everyone lived peacefully, without conflicts, until everything suddenly changed. The human ego—concern with personal benefit at the expense of the common good—erupted and caused the Babylonians to concentrate on themselves and exploit each other. At the height of the eruption, the local residents started thinking that they could control the world and built the Tower of Babel as a symbol of their egoistic aspirations. One famous Babylonian, Abraham, refused to accept this situation. He searched for what was going on behind the scenes, discovered it, and developed a method to overcome and transcend the ego. Those who listened to him gathered and learned what he revealed. 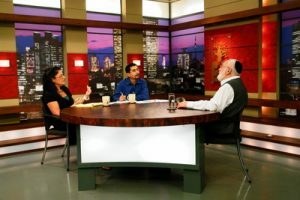 Over the years, his group of students grew and became the Israeli nation, whose uniqueness is the purpose for which it was founded: the implementation of the method to rise above the ego, the wisdom of Kabbalah, and its spreading to all nations. Today, we are again discovering ourselves as as human society closed in from all sides, just as confused as we were in Babylon. The ego has developed to a point where we’ve come to the moden Tower of Babel: a globally interconnected network of global trade and economic relations based on narrow egoistic interests. As in the past, today we have built a tower separating us and we have nowhere to run. In today’s world, humanity finds itself trapped between global interdependence that connects us, on one hand, and competitive, egoistic interests that separate us, on the other. At this juncture is exactly where we, the people of Israel, enter the picture. Kabbalists have written extensively about our unique era. On one hand, it is a time when humanity realizes that the ego leads us to a dead end, and on the other hand, it is a time when the conditions for the absorption of Abraham’s system ripen. Moreover, humanity, which will need this method, will hold the people of Israel accountable as the ones holding back the method from humanity, as if they have a secret they’re not sharing with the rest of the world. Our mission, according to Kabbalist Yehuda Ashlag (Baal HaSulam), the most renowned Kabbalist of the 20th Century, is to be a conduit to transfer the system of the ego’s transcendance to humanity. However, in order for that to happen, we must first implement it on ourselves. As long as we do not do so, suffering on personal, social, ecological and global scales will continue to increase. At the same time, humanity subconsciously feels that we, the Jews, have something special, and that we hold the key to a better life for every person on this planet. Such interdependence amounts to the fact that the more we delay in actualizing our role, the more we will be hated. The sharp rise of anti-Semitism around the world is a fact that cannot be disputed. However, unlike previous waves of anti-Semitism, this time, the root of the phenomenon and its solution are more clearly visible. The fact that the nation founded by our Patriarch Abraham has forsaken its goal does not cancel our obligation to fulfill our role. Therefore, particularly in the global era, when we are all connected in a single network, once we return to a unified state, we will be able to submit to humanity as a whole the method of unity and love among human beings. “And when they do that, it is plain to see that with His work, all envy and hatred will be abolished from humanity” (Baal HaSulam, article “The Peace“). The right work is when I awaken the Creator to connection (although underneath He is always first). If I reveal the path of light, it changes the world. If I don’t awaken the Creator, He awakens me: light that would have shone and filled me, now acts as darkness, the opposite side. Mutual guarantee is my insurance policy, guaranteeing that I’ll continue the spiritual path if I care for others, forgetting myself. Only the condition of constantly caring about bringing the group and world to the Creator, instead of myself (Arvut) guarantees spiritual progress. Those not doing spiritual work suffer from revelation of ego, evil. They want to ignore it, cover their eyes with their hands like children. But Kabbalists, like adults, understand that the Creator made evil so man will reveal Him above it. There’s nothing extraneous in creation! We can’t rise to the degree of love and bestowal until hatred, rejection, is revealed. Above them we build the right line: unity, love, closeness, mutual understanding, as written, “Love will cover all sins.” If there are no sins, there is no love—they must grow one after the other. Building new senses of perception to reveal the spiritual world means building connections between us in which we can reveal the Creator and thus give Him joy. This new perception is called “faith above reason,” the degree of Bina, bestowal, an altruistic intention. Question: The end goal of the group is to achieve adhesion with the Creator. Can their enjoyment of getting together and talking about various subjects, get in the way of that? Even if they slightly shift the emphasis, the main goal should always be more important and in front of them compared to all the other tasks and topics they have to go through on the way to revealing the main goal.